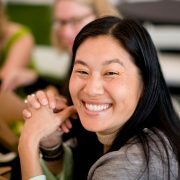 Lili Cheng is General Manager of the Future Social Experiences (FUSE) Labs in Microsoft Research, FUSE. The focus of FUSE Labs is to work in partnership with product and research teams to ideate, develop, and deliver new social, real-time, and media-rich experiences for home and work. FUSE Labs experiences give users new ways to create, connect and collaborate with the people, information and ideas that matter to them.